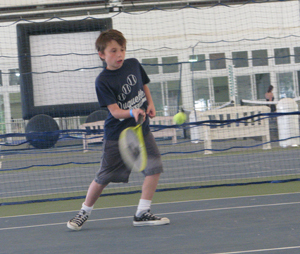 Youth Tennis with a low-compression tennis ball was introduced by USTA (United States Tennis Association) back in 2010 then became official in 2012. 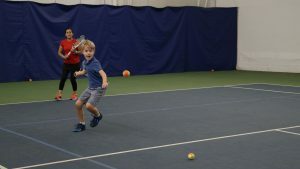 Red ball is a low compression ball that is 75% slower than a yellow ball an adult would use, it is designed for 36-foot courts and for youngsters 8 years old and under. 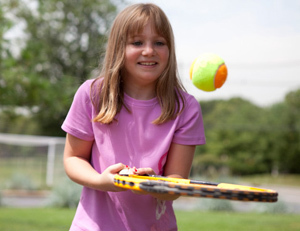 Orange ball is a low compression ball that is 50% slower than a yellow ball an adult would use, it is designed for 60-foot courts and for children 8-9 years old. Green dot ball is a low compression ball that’s 25% slower than a yellow ball an adult would use, it is designed for full courts (78-foot) and for children of 9-10 years old. Yellow ball is a full compression ball designed for full size court and for 11 years old and older. DHAC Junior Tennis Academy offers classes from the age of 3 to 18 years old, we use appropriate low compression balls based on ages and skills of the children. Here is a video for a better understanding of R.O.G.Y. A few of my favorite things….Ultimate Day Camp Edition! Well, another summer flew by! It was a quick one but we made every day count at The Ultimate Day Came here at Dedham Health & Athletic Complex ! I had such a great time this summer and I’m sad it is over! Let’s hope that mother-nature is a bit easier on us with the snowfall this winter! I’m hoping for a longer summer next year. Our waterslide tournament in the pouring rain! So much fun for us but the lifeguards were NOT happy! Crafting with the Upper Campers! More specifically, counselor Nick with a paper flower on his head! Our My First Campers dancing to “Gangnam Style”. Making our own lip gloss! Good thing the Speilman kids were there to help me through it! Team Peru winnin our very own UDC Olympics! GIANT soccer! It’s definitely cool when the ball is taller than the players! Monday morning “all camp game”. It made a strong comeback this year and the campers (and counselors) love it! The new camp garden! Tomatoes, cucumbers, carrots, herbs and so many green beans (and thumbs)! Amazing work in the theater 5 day this summer by campers and counselors! We all enjoyed the performances every Friday. I am sure that some of our actors are headed for Hollywood! “I’d like to thank UDC!” should be in your acceptance speeches! My First Campers rock climbing: they may be little, but they sure can climb! NEW Art 5 Day! Creative Campers for sure! The Ultimate Day camp counselor, DHAC swim instructors, tennis pros, rock climbing instructors, laser tag Commander Vinny, Mr. C. and Miss Sarah of DHAC Kenpo Karate, and of course “The Deli after Dark”. Enjoy school and see you all next year!